By Jim Boyce | Richard Auffrey of the blog Passionate Foodie has been a big supporter of World Baijiu Day, by writing about the event, sharing info on happenings in his state of Massachusetts and simply offering encouragement. This week he posted about new spot Sumiao Hunan Kitchen that features four baijiu cocktails. “I had two of the cocktails, the Schrodinginger’s Coupe and Perpetual Motion, and both were delicious,” says he. If you live in the area, it sounds like a place to go. 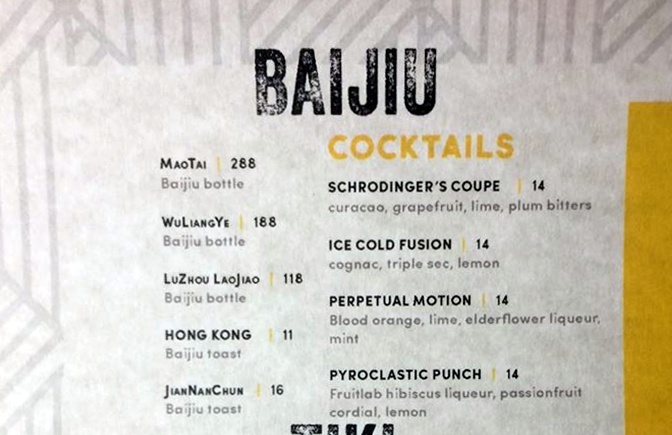 Here is a snapshot of the baijiu cocktail menu courtesy of Auffrey. Also check out some of Auffrey’s posts on baijiu, including this one: “The Durian Fruit of the Spirits World“.